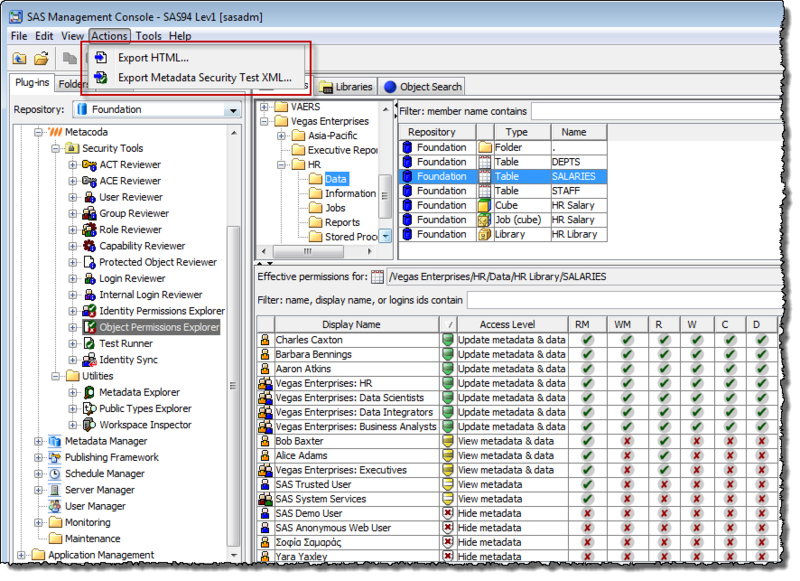 SAS Global Forum 2016 is just over 2 weeks away, and I’m really excited about showing a Permissions Tracer feature we’ll be releasing in the next version of our Metacoda Security Plug-ins. Metacoda is a SASGF sponsor again this year and we’ll be showing a preview of this new version at our Metacoda stand in The Quad, so please stop and say hello if you’re going to be there too. We’ve had some very positive feedback about how helpful our Identity and Object Permissions Explorers have been, so I’m looking forward to getting some feedback on this new feature too. One of the other reasons I’m excited is that this is something we’ve been building up to for several years as we’ve expanded our code base to help visualize the richness of the SAS metadata security model, including its interacting object inheritance paths, user identity hierarchies, and role-implied special conditions. With SAS Global Forum 2015 just a few weeks away, I’m spending most of my time at the moment working on a demo version of our next Metacoda Plug-ins release. We’ll be showing this upcoming version at our Metacoda booth in The Quad (previously known as the SAS Support and Demo Area). Export from the Object Permissions Explorer. Export from the Identity Permissions Explorer. Export from the Test Runner. After finding and selecting a metadata object in the Object Permissions Explorer you can now export a HTML report showing all of your users and/or groups, together with their effective permissions and access levels on that object. SAS® Global Forum 2014 is now only a few days away, and I’m excited (and a little nervous) about presenting my paper Test for Success: Automated Testing of SAS® Metadata Security Implementations. Update 03Apr2014: My paper is now available for download from the SAS Global Forum 2014 Online Proceedings. SAS metadata security testing is a topic I’ve been contemplating for a long time now. For many organizations, metadata security is an important feature of the SAS platform. It enables them to control access to business resources described by the metadata and ensure their users can only use SAS applications to view and modify resources appropriate to their roles within the organization. SAS Global Forum 2014 is just around the corner and I’m getting really excited about it. There is so much content for SAS platform administrators this year. I had been thinking of posting a list of admin related papers I was keen to see, but then I saw that Greg Nelson from ThotWave wrote a SAS Users Groups blog post, “SAS Administration-palooza!”, which has a much more comprehensive list than I had. I’d encourage you to have a look through Greg’s list for some great suggestions to add to your schedule. I certainly picked up a few I had missed. If you can’t go to the conference itself then it’s also a great reading list for when the papers become available online. If you arrive on Saturday then you might also want to head along to the TweetUp too. I hope to see you at #SASGF14. I’ll either be at those admin papers, walking around the demo hall checking out all the new cool SAS software, or at the Metacoda stand talking to people about our products. If you see me please say “Hello”. I’m back in Australia now after attending SAS Global Forum 2013 in San Francisco last week. As always it was a fantastic conference where I got to meet lots of other enthusiastic SAS users, see some great papers about SAS software (though I never seem to see as many papers as I originally planned), and spend lots of time in the demo hall. The demo hall is one of my favourite places. You can talk to SAS developers and product managers about what’s coming in the next major release of SAS (9.4). The demo hall is also where Metacoda (my company) had a SAS Alliance Member sponsor stand and got to show our latest Metacoda products. Meeting our customers from the other side of the globe is always a highlight of the conference for me.